KnowMade was founded in 2009 by Nicolas Baron and Brice Sagot. Our headquarters are located in south-east France, in the Sophia Antipolis technology park – the first of its kind in Europe – from where we have developed an extensive professional network. As specialists in the research and analysis of scientific and patent information, our mission is to meet all your information-related needs. To achieve this, we provide customized monitoring services and on demand studies with high added value. We process scientific and technical data in order to provide you with accurate and valuable information for your decision-making processes. 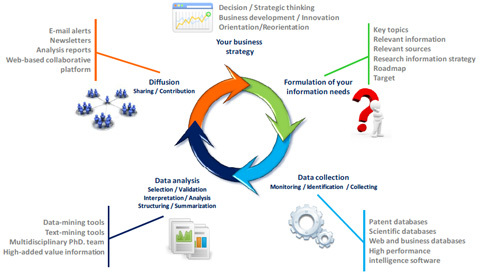 Our intelligence digests play a key role to define your innovation and development strategy. Our mission is to provide you with all relevant information to any innovation that could alter your technological environment. To do this, we guide you during every step of your watch process. Setting up a technology intelligence unit within a company is a complex, expensive and time-consuming process. While there are some items of software available on the market that pledge to make this process as painless as possible, software alone is simply not enough! A good word processing program will never enhance an author’s writing skills, but merely make editing easier for them. The same applies to competitive intelligence software.Therefore, the competitive intelligence analyst, in addition to mastering the techniques for researching and analysing information, must also be experts in the sector to be tracked, so that they can validate and synthesize the information and provide a intelligence digests with high added value. This is why the KnowMade’s team is made up solely of highly qualified experts (PhD) who have been trained in the most effective technology intelligence techniques, so that they can provide you with information that is best suited to your needs. A complete service, including guidance, research, and sending of high-added value reports, together with quality control throughout the entire process. Access to the best sources of professional information (patents, scientific and technical publications, laws, competitors, etc.). A customized service that is based on constant contact and changes in line with your feedback and any new directions you wish to take. A team of highly qualified experts (PhD) who are always on hand to ensure your needs are met and make any necessary adjustments to the intelligence process. Cost transparency, ‘all-inclusive’ offers with no hidden extras, and free quotes. Traceability of our researching of information. Since 2013, our partnership with YOLE GROUP enables us to complement our offer services and adds a market view to our reports. Yole Développement is a market, technology and strategy consulting company, founded in 1998, operating in the fields of MEMS, Compound Semiconductors, LED, Image Sensors, Optoelectronics, Microfluidics & Medical, Photovoltaics, Advanced Packaging, Nanomaterials and Power Electronics. SystemPlus Consulting is specialized in technology and cost analysis of electronic components and systems in the fields of Integrated Circuits, Power Devices and Modules, MEMS & Sensors, LED, Image Sensors, Packaging including wafer level, Electronic Boards and Systems.